On a scorching, sunny Sunday 5th August UKAFH members and guests headed to the south east corner of Kent to Betteshanger Country Park (near Deal) to hunt for Carboniferous plant fossils. Betteshanger is a RIGS spoil heap at the old Betteshanger Colliery, which was the largest in Kent but was closed in 1989. Betteshanger Country Park was created by regeneration of the former Betteshanger colliery site and provides a large green parkland and recreation area ideal for walking, cycling and other outdoor activities. However as part of Geoconservation Kent (http://www.geoconservationkent.org.uk/), there is agreement to retain a fossil hunting area within the country park. The fossil collecting spoil heap, which is northeast of the original site, is set aside for the study of the fossils to be found in the coal measures formerly mined there and this was our destination for the day. Our group of 25 assembled outside the visitor centre, which offers toilets, showers, information on the park and a small cafe alongside a childrens’ play area. From there it was quite a short walk to the fossil hunting area where Andy Temple of GeoConservation Kent awaited us as our special guest leader for the day. Andy regularly supports school and group trips and visits to Betteshanger and other Kent locations and is expert on the many, varied plant fossils to be found in the coal deposits. Sam Caethoven welcomed the group and introduced Andy who gave an overview on the site and what can be found. Betteshanger is Upper Carboniferous (Silesian) in age, from the mid-Westphalian Stage (Asturian Substage of 323.2–315.2 Mya) to the Stephanian Stage (Stephanian B Substage of 315.2–307 Mya). The rocks are from between 316–311 Mya and mostly consist of the Kent 5 coal seam, with some Kent 7. Kent 5 is assigned to the Upper Coal Measures (Warwickshire Group) and Kent 7 to the (South Wales) Middle Coal Measures. Fossils show that there were areas of forest and river levees, with overbank deposition taking place. Fossils at Betteshanger are found either lying on top of the spoil heap or by digging into the spoil. Remains of Arthropleura, a large arthropod, have been found at the site. However, unlike other coal measures sites in Europe, no insects have been found at Betteshanger. When we arrived at the fossil area we were delighted to be informed by Andy that a digger had just been in to turn over the coal spoil and dig out fresh areas, removing the old spoil that had already been examined many times previously. As a result we were extremely fortunate to be able to find abundant, varied plant specimens! Fossils were quickly being found, both in quantity and variety. Kath Kemsley found a smashing Neuropteris seed fern and Aiden Philpott found an exquisitely preserved Alethopteris seed fern. Jake Ashley found a very nice example of Lepidodendron (also known as a scale tree) which is an extinct lycopsid club moss. Kaitlin Asher found a fantastic selection of plant fossils and Nicky Parslow uncovered a beautifully detailed example of asterophyllites horsetail. The swampy Carboniferous landscape was dominated by three types of plant: ferns (true ferns and seed ferns), lycopods and sphenopsids. Ferns were at their most abundant and diverse in the Carboniferous period but persist today. Giant lycopsids – clubmosses – such as Lepidodendron and Sigillaria grew to the height of trees and their fossilised bark is characterised by leaf scars. The fossils of the root systems of both these plants are called Stigmaria because they look so similar. These are examples of form taxa, where a collection of organisms is given a taxonomic name but is known to be a grouping based on similar morphological characteristics, rather than more extensive biological similarity. Finally the sphenopsids consist horsetails which were gigantic in the Palaeozoic but persist today in much smaller and less diverse forms. The leaves of horsetails, which form in whorls around the stem, are termed annularia but the root fossils are known as calamites. Huge thanks to Andy Temple for bringing a fabulous display, expert advice, identification and preservation tips and plenty of very useful spare newspaper for wrapping finds! This entry was posted in Reports and tagged annularia, calamites, Carboniferous, event, fern, fossil, horsetail, lycopod, plant, seed, sigillaria. On Sunday 1st October, UKAFH ventured along the coastline of Seaford in East Sussex – a small town about 10 miles east of Brighton with towering white cliffs. After a very fortunate summer meteorologically speaking, we had spent the week with a close eye on the remanence of hurricane Marie which crossed the Atlantic and now threatened our fossil hunt. Fortune persisted however, as although a bit windy and the sea choppy, we began the day dry and mild. We began with an in depth talk about the geology by UKAFH leader Daniel Slidel. Exposed in the towering white cliffs of Seaford is the Upper Chalk, a Cretaceous deposit (Santonian-Campanian) about 86-83 million years old. Formed from the tiny platelets of coccolithophores – phytoplankton that was abundant in the deep, warm sea that existed here. This striking sediment helped preserve the creatures dwelling on the sea floor, which included bivalves, sponges, corals, bryozoan and the echinoids (sea urchins) this stretch of coastline is famous for. Within the cliffs are horizontal bands of flints which are visible as far as the horizon allows. After a short walk from the car park we descended some concrete steps onto the beach. The abundance of fossil echinoids was immediately noted as within the exposed bedrock on the foreshore were the tell-tale circular marks of weathered echinoids in situ. We could not extract these as the bedrock here is protected, however this gave us ambition as we traveled west towards loose boulders from which we could extract specimens. It was not long before beautiful echinoids were being found loose or extracted from boulders. There were two genre found, Echinocorys and Micraster. These were found in chalk boulders preserved with delicately thin calcite test – however the flints on the foreshore should not be overlooked either as more robust and often sea rolled specimens for found here too. Other finds on the day included small bivalves, shapely sponges, coral and bryozoan. As the afternoon drew late the atmosphere became heavy with the approaching storm and the first rain fell as we ascended the concrete steps back to the car park. Looks like we did it again and avoided the worst of the weather! Thank you to everyone who attended this fossil hunt. It really was a great and friendly group of people, it was a pleasure to guide you through the Cretaceous geological history of Seaford. Hampton, M.J., H.W. Bailey, L.T. Gallagher, R.N. Mortimore and C.J. Wood 2007. The biostratigraphy of Seaford Head, Sussex, southern England; an international reference section for the basal boundaries for the Santonian and Campanian Stages in chalk facies. Cretaceous Research, v. 28, no. 1, p. 46-60. This entry was posted in Reports and tagged Chalk, cretaceous, east sussex, echinoid, fossil, fossil hunt, seaford. Dinosaurs of China – Ground Shakers to Feathered Fliers is an internationally significant exhibition featuring 26 spectacular specimens from China, including some of the best-preserved dinosaur and bird fossils from anywhere in the world. The exhibition takes place from 1st July – 29th October at Wollaton Hall, Nottingham, and Nottingham Lakeside Arts. UKAFH and Deposits magazine were fortunate to attend the press preview and get a really good look at these incredible fossils. We also heard from the Chinese specialists who have researched and presented these extraordinary specimens, were given a tour of the exhibition by curator Dr. Adam S. Smith and heard the views of broadcaster and naturalist Chris Packham who is spokesperson for the exhibition. UKAFH patron Dean Lomax was also at the preview and gives us his opinion of the exhibition. We arrived to find raptor footsteps climbing the stairs up to the entrance lobby. Hunter, the exhibition’s animatronic Sinraptor who has promoted the show along with Diana Saurus over recent months, had clearly arrived before us! We had time to see the large “ground-shakers”, headlined by the towering Mamenchisaurus, before the welcome introductions began. Introducing the exhibition, Dr. Adam S Smith described his favourite exhibit, Microraptor gui as the “smoking gun” of the fossil record, showing the unquestionable links between dinosaurs and birds. The fossil on display is the holotype specimen, fully articulated and with signs of feathers on all four limbs. Speaking next, Chris Packham went on to acknowledge how our understanding of dinosaurs has transformed as scientific examination has improved and developed and more specimens have been discovered, including the extraordinary fossils from China which have remarkable soft tissue and feather preservation. The emergence of more specimens and our ever-changing understanding reminds us that we never have all the answers and that our curiosity of dinosaurs can therefore endure and inspire future generations to constantly pursue better understanding. He went on to remind us that the exhibition principally serves to remind us that dinosaurs are not extinct and that they surround us every day in the form of modern day birds. Indeed, the curation of the displays carefully blends the fossil specimens with birds from Wollaton Hall’s natural history collection, which is one of the most extensive natural history collections in the UK. Time – the oldest fossils, the ground-shakers in the first room, date from around 160 million years ago during the Jurassic period. Progressing through the following rooms the visitor journeys forwards in time to the Cretaceous period where the fossils represented are 135-120 million years old. Evolution – the early fossils have few bird-like characteristics, although we are encouraged to look for them (Guanlong, a theropod ancestor of Tyrannosaurus rex is displayed alongside the skeleton of an ostrich and visitors are encouraged to seek out how the skeletons have shared characteristics; features which resemble each other). Discovery – the advent of dinosaur excavation in China was initially led by teams of Western palaeontologists, meaning the earliest discoveries were given traditional latin-based names. Later discoveries came from Chinese and Western paleontologists working together but as the number of important fossil locations and discoveries increased and the science grew in importance to China, so did the number of scientists specialising in this field in China. The vast majority of recent finds are specimens which have been given Chinese-based names which speak of the discoverer, location or morphology of the specimen. Beginning in the great hall, the ground shakers are overwhemingly dominated by the gigantic Mamenchisaurus. Mounted in an improbable, but not impossible, rearing posture, the relative of the Western Diplodocus stretches to the height of the gallery – the only way the skeleton could be fitted inside the building! Although the skeleton is a cast, alongside it stands a genuine femur together with a height scale to allow visitors to both touch the bone and compare its enormity to their own height. In the shadow of Mamenchisaurus are the diminutive Protoceratops and Pinacosaurus – relatives of Triceratops and Ankylosaurus respectively. Protoceratops is a delicate beast similar in size to a sheep. Pinacosaurus remains in his protective plaster jacket, almost as if in a nest. The jacket shows us the field techniques used by scientists to protect and support the fossil during extraction and transportation and the Chinese labelling reminds us of the origin of the fossil as well as the importance of recording all details of the specimen from discovery onwards. Something the exhibition conveys well is the sense that these fossils have travelled – from the field to the laboratory to the museum and ultimately to this one-of-a-kind exhibition. Many of the specimens are displayed on their packing cases as plinths and meticulous Chinese specimen labelling is evident in abundance. Continuing around the ground-shakers we see the terrifying carnivore, Sinraptor. The specimen is a juvenile and would have been much meaner as a full adult, even able to predate on Mamenchisaurus. Finally we encounter Lufengosaurus, the first dinosaur discovered, studied and displayed by Chinese scientists. As such this specimen encapsulates the essence of this exhibition. Alongside the ground-shakers, displays remind us that each of these Chinese fossils are closely related to the more familiar North American cousins like Allosaurus, Triceratops and Ankylosaurus and also draw our attention to the bird-like characteristics already present in the skeletons of early dinosaurs. Moving on, we begin our voyage through time towards the emergence of true birds by passing through a kink in time – dinosaur fossils displayed in the midst of Wollaton Hall’s fine collection of bird exhibits. In amongst the feathers, beaks and claws of modern birds of extraordinary diversity we meet Oviraptor, named “egg thief” because it was found with eggs and mistaken to be feeding on them. we now know it incubated its eggs in a nest, just as do modern birds. The backdrop to the skeleton is a beautiful work of palaeoart depicting Oviraptor with its eggs. Alongside is a fossil dinosaur egg which has become preserved with an exquisite mineralised centre. Next to the egg is a dinosaur footprint discovered in nearby Mapperley, reminding us that dinosaurs really did once dominate Nottinghamshire and that Wollaton Hall has a very fine collection of fossils of its own. Finally we encounter Mei Long, a tiny troodontid dinosaur small enough to fit in the palm of your hand, which was fossilised curled up, tail wrapped around its body and head tucked under its arm, a posture familiar in modern birds when they rest or sleep. The accompanying palaeoart reminds us of a small duck resting on a riverbank. Although only its bones are known, it would most likely have possessed feathers like other troodontids. Climbing the stairs, we feel as if we are elevating ourselves like the dinosaurs growing feathers and ultimately adapting them to flight. Immediately we encounter Sinosauropteryx, the first feathered dinosaur ever described. The stunning, fully articulated fossil preserves the finest detail of feathers and soft tissue. The downy feathers are filamentous and unsuited to flight. We cannot know with certainty what they looked like or their purpose but speculation is that they may have served as camouflage, display or possibly thermo-regulation. Alongside is Dilong, a fuzzy-feathered tyrannosaurid, and a cast of Linheraptor, a beautiful specimen but also a reminder that casts are extremely important: casts preserve how the fossil was found and how the bones and other remains were articulated; important information which is lost once bones are extracted, cleaned and mounted. As we move through the room each specimen outdoes the previous one. It is truly impossible to describe how remarkable these fossils are for the exceptional preservation of soft tissue and feathers. Next we see the actual holotype fossil of Caudipteryx, whose stomach contains a multitude of tiny gastroliths, swallowed to aid the grinding and digestion of food, a practice still employed by modern birds today. It has long feathers preserved on its arms but its long legs and short arms suggest it was flightless so the feathers (which are also present on the tail of other Caudipteryx fossils) were likely for display. Alongside is Epidexypteryx, a dinosaur with long, ribbon-like tail feathers. Nearby we find Sinornithosaurus, a close relative of Velociraptor, clearly displaying a covering of fuzzy feathers. Towering in the centre of the room is Gigantoraptor, the largest bird-like dinosaur yet discovered anywhere. From the same family as Caudipteryx, this titan surely had feathers too! The fossils seen so far are truly astounding. Incredibly, the best is yet to come! At the end of the room we see three extraordinary fossils side by side. Microraptor gui, the actual holotype specimen, is a flying dinosaur. The fossil displays the indisputable dinosaur characteristics of teeth, hands with claws, a long bony tail and yet it visibly has bird-like feathers which clearly prove it had the ability to fly. Alongside is Yanornis – a true bird but with residual dinosaur characteristics of clawed fingers. This is the point where the viewer has to stop and pause and allow the moment to sink in of just how profoundly important these fossils are to our understanding of the evolution of dinosaurs. To emphasise their importance, and telling a cautionary tale, the central fossil of the display is a replica of Archaeoraptor. This “new fossil discovery” was heralded with great fanfare in 1999 in National Geographic as the missing link between birds and dinosaurs. In fact, it is a fake. Part Microraptor, part Yanornis, with legs from an as-yet unidentified third fossil, this fake reminds us of the importance of careful scientific study, re-examination of fossils as new techniques are developed and that rarity and value can come hand-in-hand with greed and deception. Entering the final room, we meet some of the earliest known true birds and feathered flyers; Protopteryx, Confuciusornis, Yi qi and Wukongopterus. Protopteryx and Confuciusornis retain some dinosaur-like characteristics like clawed hands and, in the former’s case, teeth but are clearly accomplished flyers. The long tail feathers on Confuciusornis are thought to be for display and demonstrate sexual dimorphism between males and females of the species. Meanwhile Yi qi , the most recently discovered fossil of the exhibition, breaks the mould. It is a dinosaur and has a feathered body but instead has evolved bat-like webbed wings to achieve flight, demonstrating convergent evolution towards an optimal solution to a problem (much as bats have done). Wukongopterus found the same solution to flight, evolving a long flight finger and membrane wing. Wukongopterus is, of course, a pterosaur. So why did so many creatures find a way to evolve flight, time and again, across deep time? Flight provides niche access to food, a means of escape from predators and an ability to spread and colonise new environments as old ones become overcrowded or unsuitable. Given its advantages, any creature who could evolve and adapt to the air had a good chance of a long lineage. Although this culminated the Dinosaurs of China exhibition at Wollaton Hall, there is still a great deal to see at this exceptional natural history museum and as we enjoyed the permanent exhibits we were able to see preparations underway to create a permanent exhibit of the best of the museum’s own considerable fossil collection. As we looked on, acclaimed palaeoartist Bob Nicholls applied the finishing touches to a representation of the marine reptile Liopleurodon, a model built around the exceptional tooth held by the museum to demonstrate the size and power of the creature which possessed the tooth. Whilst the fossils are truly exeptional and incredibly important and worthy of careful study by academics and amateurs alike, the exhibition does not overlook our palaeontologists of the future. Whilst Hunter and Diana Saurus have tirelessly promoted the event publicly, the exhibition itself is very accessible to children including beautiful palaeoart which depicts all the fossils on display in life, imagined by artists who are equally palaeontologists and whose careful study of the most recent scientific knowledge informs their depictions. We don’t see the scaly lizards of Jurassic Park but renderings which attempt to bring the mind to see these creatures as we know them to have been based on the most modern science available. The debate moves on as scientific techniques improve and new and better discoveries are made and our minds must move with them. And if that’s not enough, there are quizzes, trails and even photo opportunities! This exhibition is truly unique and its like may not be seen again outside of China. It is the result of extraordinary hard work and collaboration between the Chinese institutions who have discovered, studied and displayed these fossils, IVPP and Nottingham City Council and the University of Nottingham, who extended themselves many years ago to be the first university to site a campus in China. This very special relationship has borne extraordinary fruits that we can partake in for the briefest of moments. And we should. The exhibition runs until Sunday 29th October. This entry was posted in Reports and tagged bird, birds, china, cretaceous, dinosaur, feathers, flyer, fossil, fossils, jurassic, Nottingham, wollaton. UKAFH exclusive interview with Chris Packham, broadcaster and naturalist, at Dinosaurs of China exhibition. UKAFH reporters Aidan Philpott, Nicky Parslow and Sam Caethoven visited the press preview of Dinosaurs of China and gained an exclusive interview with BBC’s Chris Packham. Here he gives us his views on the exhibition and tells us about his own interest in fossils as an amateur collector. Chris has been a fossil enthusiast since childhood and still recalls modelling his first plasticine T-rex as a child, complete with teeth and claws but with a dragging tail (to stop it falling over) and keeps a diary of his fossil finds. UKAFH: How did you start fossil collecting? CP: I grew up in Southampton so as a child I used to regularly go to nearby Bracklesham Bay where I collected bivalves, shark teeth and turritella gastropods. I recall when they built the power station they dug a tunnel under the Solent which went through the Bracklesham beds. The spoil from the tunnel works was deposited at Warsash and I found my best shark tooth there. I still have it. We used to have family holidays in Lyme Regis too and I was always begging my parents – unsuccessfully – to get up early to beat the crowds to the beach and Black Ven. I remember other fossil hunters being kind and I still have a good ammonite that a local collector gave to me when hunting there as a kid. Oddly, even though we lived in Southampton, we never went to the Isle of Wight. But now my partner owns a zoo next to Dinosaur Isle so I look out for fossils when walking the dogs at Yaverland and have found a few bits. 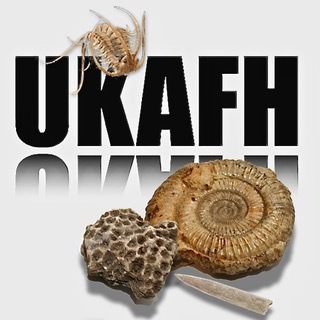 UKAFH: What do you think responsible amateur fossil hunters contribute to science? CP: When I am on the Isle of Wight I see the enormous conflict between scientists and amateurs. But amateur collectors have found a lot of fossils. Fossil collecting should primarily be about science (an enquiring mind and a wish to preserve and study) rather than money (purely commercial collecting). Amateurs contribute a lot by being out there in numbers and finding fossils. UKAFH: What fossils do you have on display? CP: I have a collection of axe heads – human ichnofossils – on display. I also have a museum quality T-rex skull that was given to me once as payment in kind! Aside from that I have 1/3 scale casts of T-rex and Triceratops and a really great Ichthyosaur coprolite (fossil poo) from Lyme Regis. I also have a Carcharocles megalodon tooth which sits on top of my microwave. It isn’t huge but it’s really good quality and cost around £40. If investing in fossils I consider quality is a better investment than size. My dream is to own a banana sized T-rex tooth. CP: Next week I’m off to the Black Hills, South Dakota, on a T-rex dig. I’m wildly excited as the Tyrannosaurus rex is an iconic dinosaur known to everyone and was the dinosaur I modelled from plasticine as a child. I’m making a show about the T-rex which is due to air at Christmas as a 1 hour special which will look at how our understanding and depiction of the dinosaur has evolved over the years. The programme is inspired by David Hone’s Tyrannosaur Chronicles. The programme will see what a wide range of contemporary scientific research and techniques is revealing to us about T-rex physiology, biology, behaviour, diet and environment. Best of all, by the time the programme airs it will already be out of date because our understanding of dinosaurs is constantly changing and growing so there is always more to know. UKAFH: Tell us your thoughts on the Dinosaurs of China exhibition here at Wollaton Hall, Nottingham. CP: What this amazing exhibition really demonstrates is how our understanding of dinosaurs has transformed as scientific examination has improved and developed and more specimens have been discovered, including these extraordinary fossils from China which have remarkable soft tissue and feather preservation. The emergence of more specimens and our ever-changing understanding reminds us that we never have all the answers and that our curiosity of dinosaurs can endure and inspire future generations to constantly pursue better understanding. This exhibition principally serves to remind us that dinosaurs are not extinct and that they surround us every day in the form of modern day birds. In fact, the curation of the displays carefully blends the fossil specimens with birds from Wollaton Hall’s natural history collection, which is one of the most extensive natural history collections in the UK. WE don’t know if dinosaurs evolved feathers for warmth or display but can examine the clues And study the fossils and continue to learn. UKAFH: The exhibition also focusses strongly on palaeoart. What are your views on this? CP: Palaeoart is hugely important as the public face of palaeontology. People see dinosaurs depicted in books, pictures and films and it profoundly influences how we think of dinosaurs. I recall desperately wanting to see 1 Million Years BC as a child because I wanted to see moving, living dinosaurs portrayed on screen. I was hugely disappointed. Even at a young age I could see through the prosthetic horns on iguanas, enlarged tortoises and badly animated dinosaurs. Seeing specimens in the bone or, as with Dinosaurs of China, in the feathers and flesh, is hugely important to our understanding. Palaeoart can represent truth and beauty and reflect and portray animals according to the most up-to-date scientific knowledge, directly contributing to public perception. It is always disappointing when opportunities to achieve this are missed, such as Jurassic World persisting with the scaly, mis-sized beasts of the earlier and less informed original Jurassic Park. This entry was posted in Reports and tagged china, Chinasaurs, Chris Packham, dinosaur, Dinosaurs of China, fossil, Fossil Hunting, fossils, Nottingham, Wollaton Hall. This entry was posted in Photos and tagged ammonite, bivalve, Finds, fossil, fossils, gastropod, jurassic, Ketton, Ketton Quarry, ukafh.